More horrors from the MARVEL UK back catalogue: a copy of the much-deried (I can't imagine why) SPIDEY COMIC from November 1985, six weeks before the long-runner (dating back, under numerous names and formats, to 1973) was finally spiked. 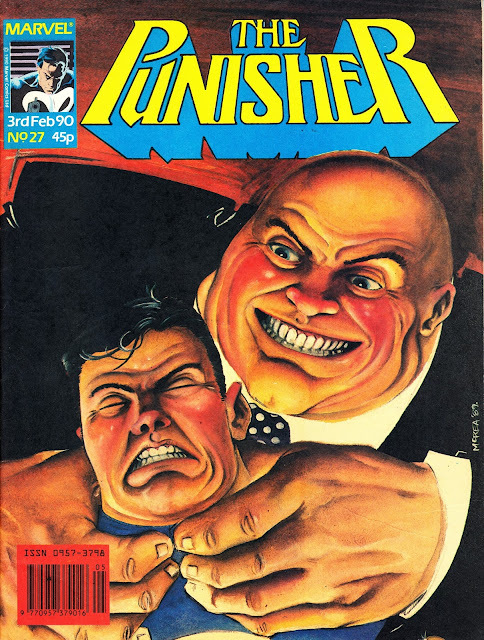 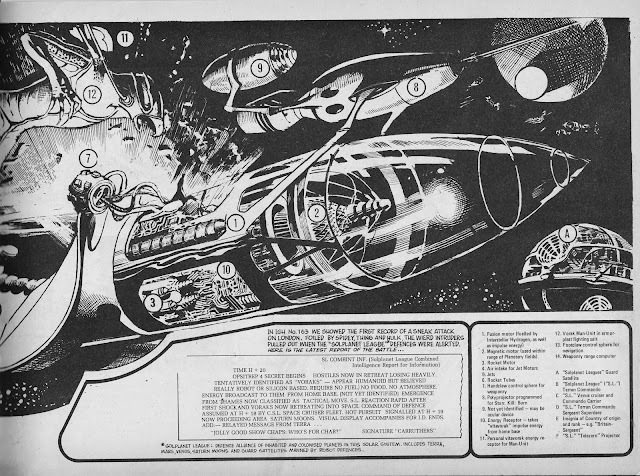 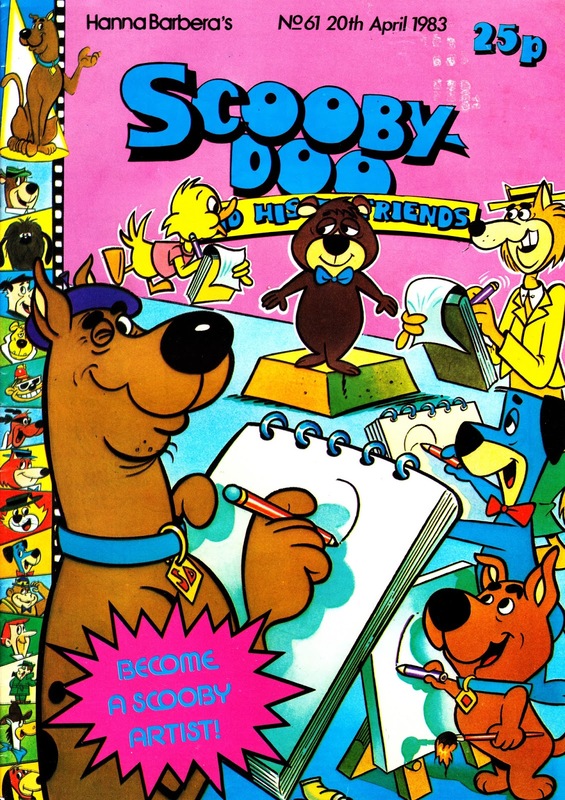 This same piece of art had previously adorned the cover, complete with the same text, of issue 525, cover-dated 30 March 1983. 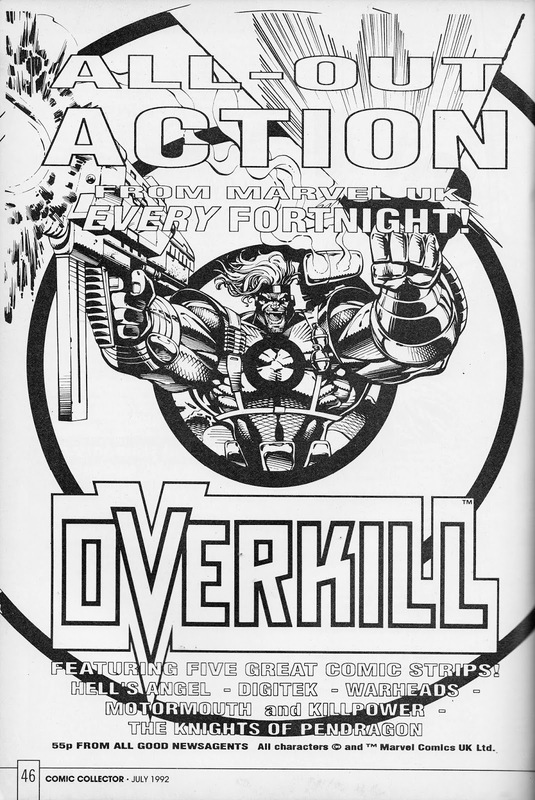 By this point, Marvel UK had no shame. And - apparently - no budget. 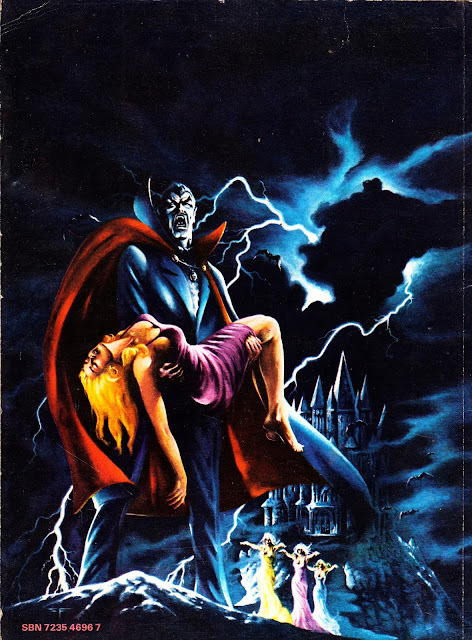 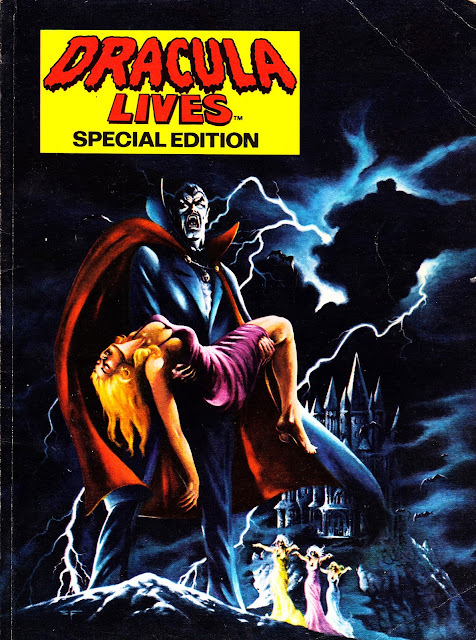 Here's another obscure items from the MARVEL UK vaults: THE DRACULA LIVES SPECIAL EDITION, published by those purveyors of shoddy hardbacks (although this is an A4 softcover with black & white interiors) World Distributors. 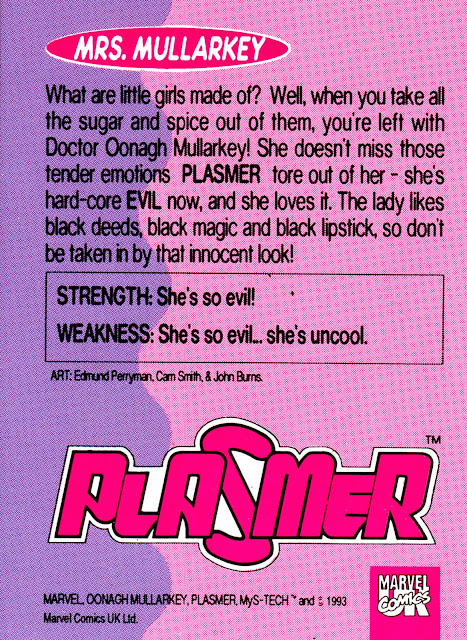 There's scant information inside so dating this one-shot is a little tricky. The two reprinted strips, Night of the Stalker and Let It Bleed, hail from 1974 so this likely appeared mid-seventies, probably alongside the regular DRACULA LIVES weekly (1974-76). 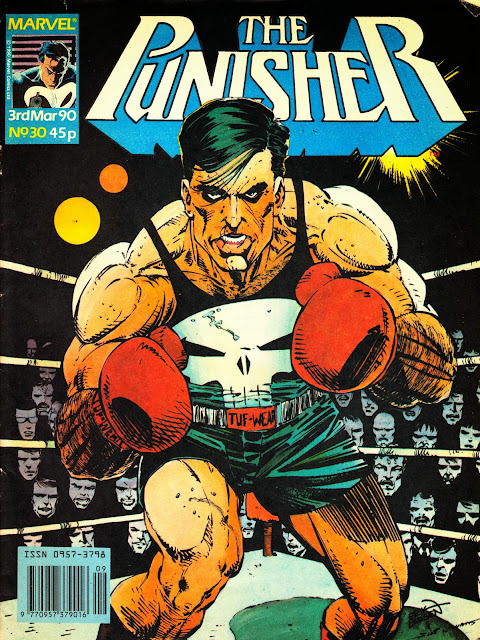 I have the run of DL but I've not had a chance to check to see if this received any plugs, which would help narrow down the publication date more. 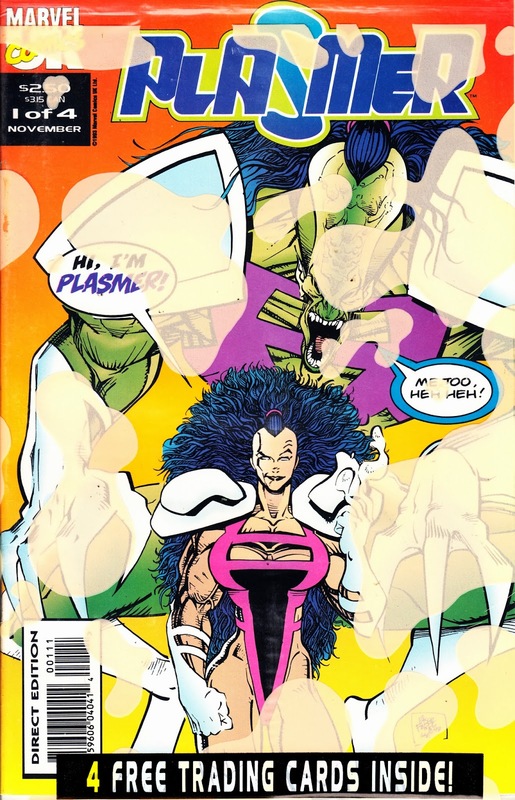 The copy I have has loose interior pages and a quick bit of Googling uncovers a retailer selling another copy (for more than double what I paid) who also notes loose pages so I assume the binding quality wasn't stellar. 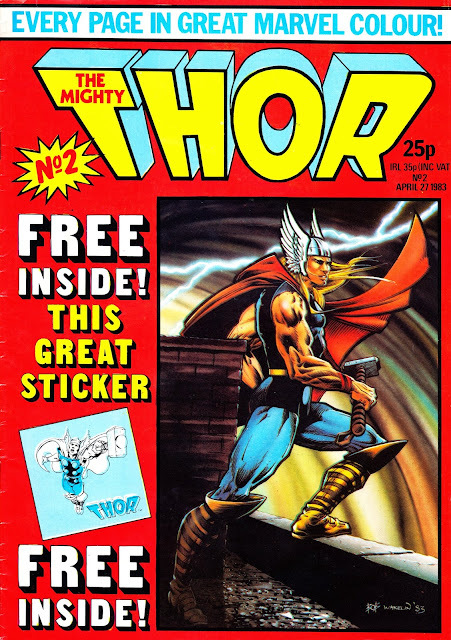 The new THOR movie is about to open in cinemas (the first was surprising good) so I thought, to mark the occasion, I'd start a COVER GALLERY devoted to THE MIGHTY THOR, the Thunder God's short-lived British weekly. 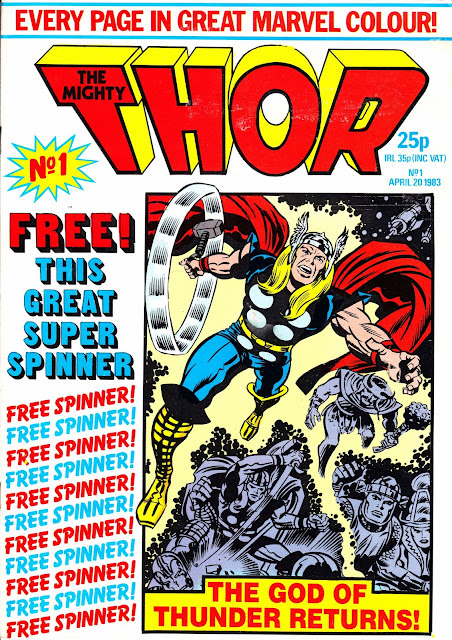 Thor had already been knocking around the Marvel UK line for a decade (and was a fixture of the sixties Power Comics line before that), dating back to the launch of SPIDER-MAN's weekly in early 1973, but this was the first (and, I think, only) time he - ahem - flew solo in an ongoing series. 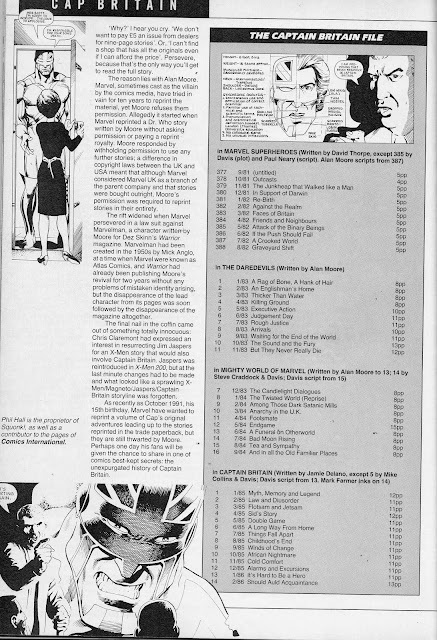 The weekly only lasted 19 issues (and another 20 as the combined THOR AND THE X-MEN... but, in the words of Kevin Arnold, we'll get to that) which makes it little more than another minor title in the succession of short-lived reprint titles hatched, matched and dispatched by the Annex of Ideas. 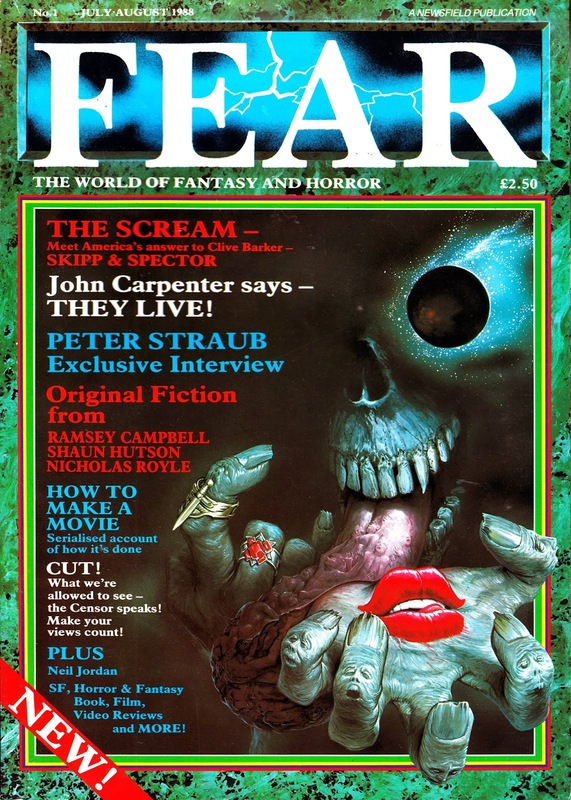 The first issue looks pretty good. 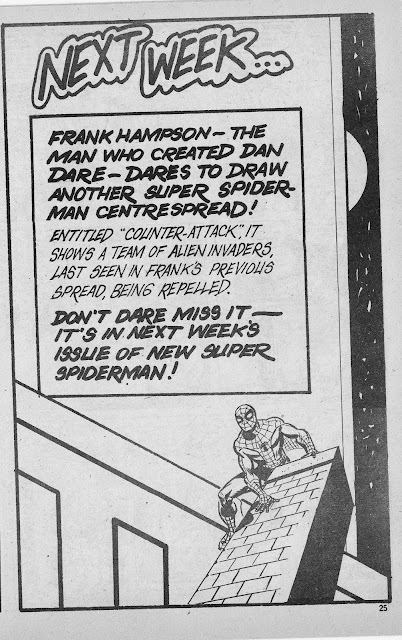 The dated early seventies Lee/ Kirby strips weren't the best choice to hook in eighties kids (and, yes, they'd already done the Marvel UK rounds at least once before) but at least (apart from the back page, see below) they were presented well (and maybe long-time older fans would have welcomed the chance to see vintage strips in colour). 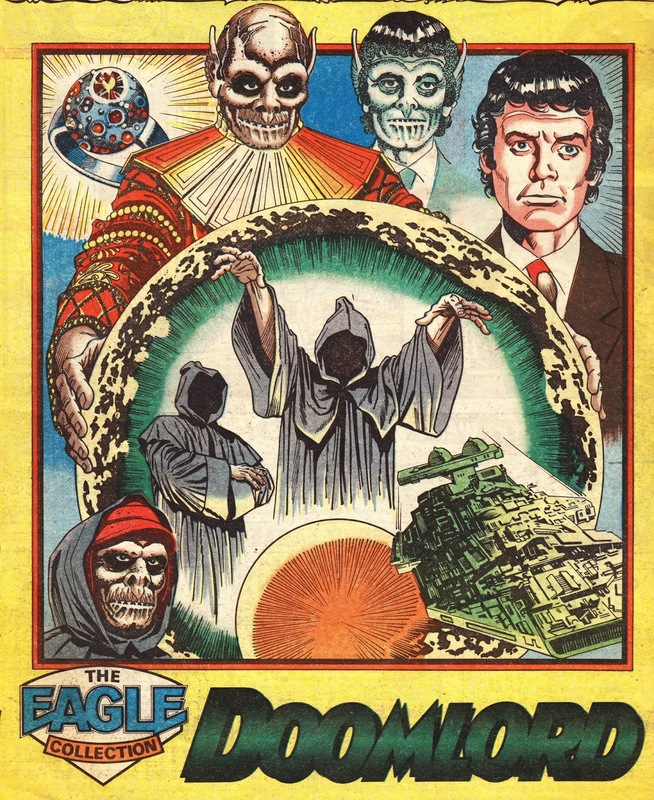 And then the second issue hit newsagents. 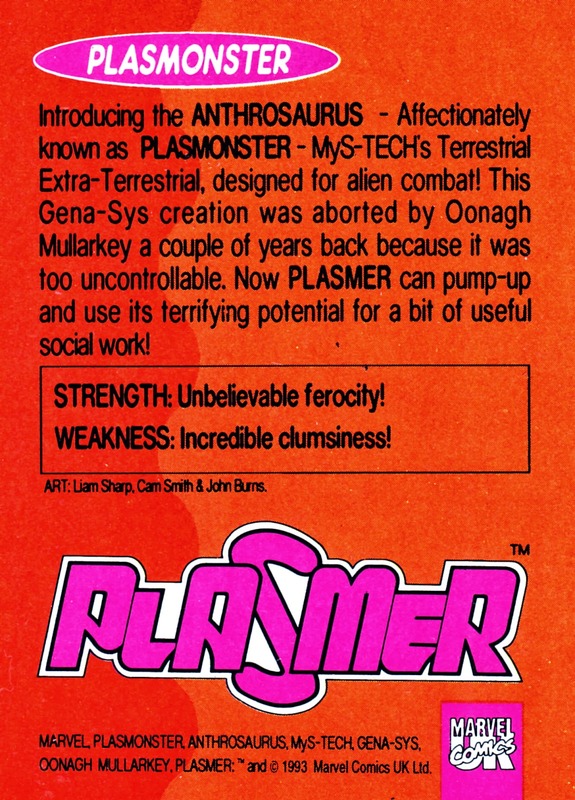 What a mess. 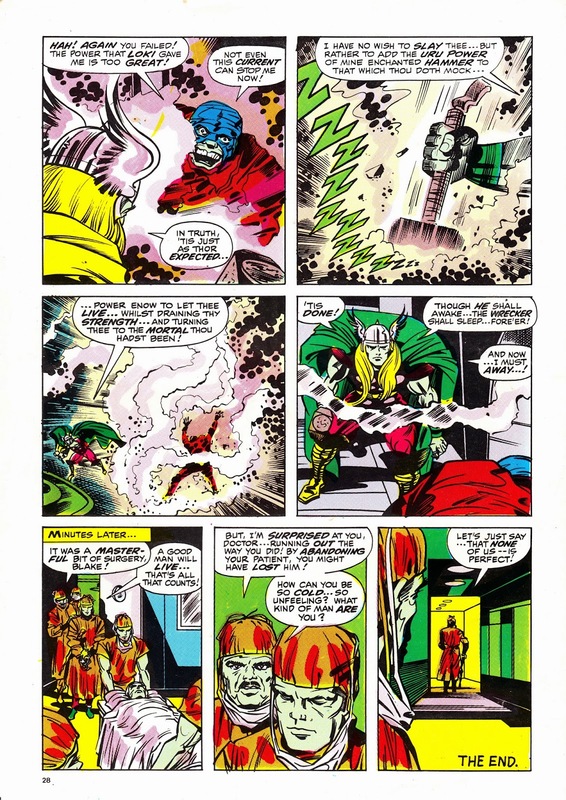 The bulk of the colour plates were out-of-register (Marvel couldn't colour within the lines!) and pages were also often creased. 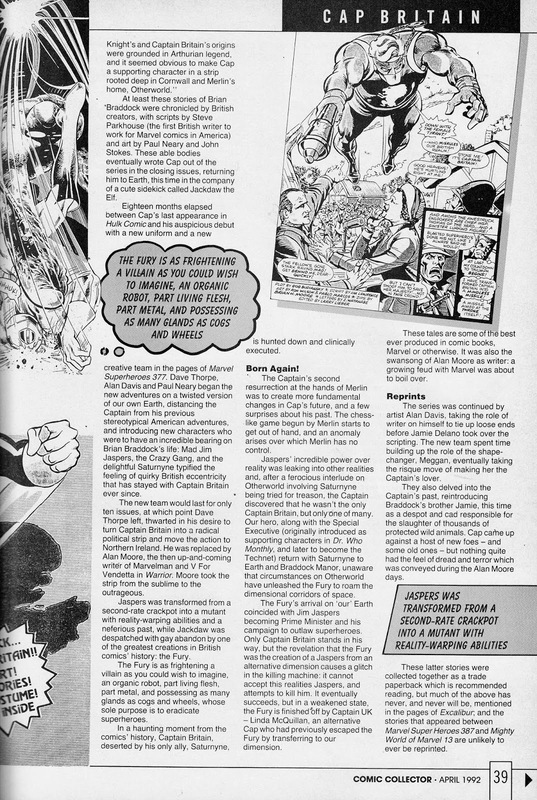 The same problems - which lasted for weeks - also cursed the earliest issues of THE X-MEN (the second colour weekly) and the revived THE MIGHTY WORLD OF MARVEL (monthly). 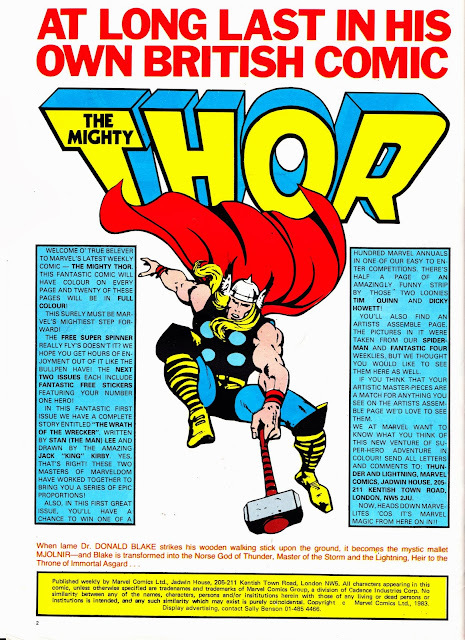 The "great Marvel colour" masthead looked pretty stupid. 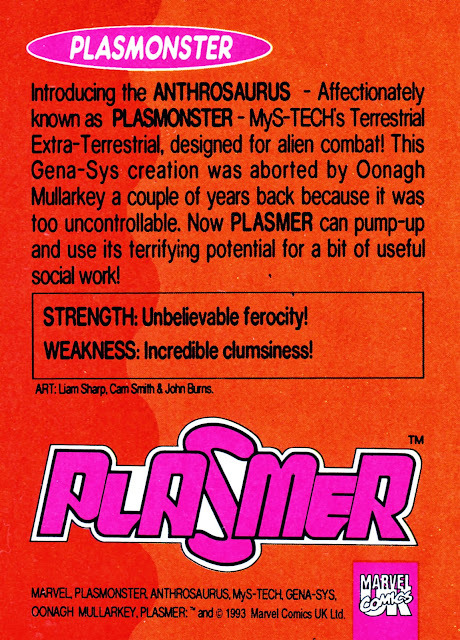 These early teething problems must have really affected sales and almost certainly contributed to the demise of both titles. 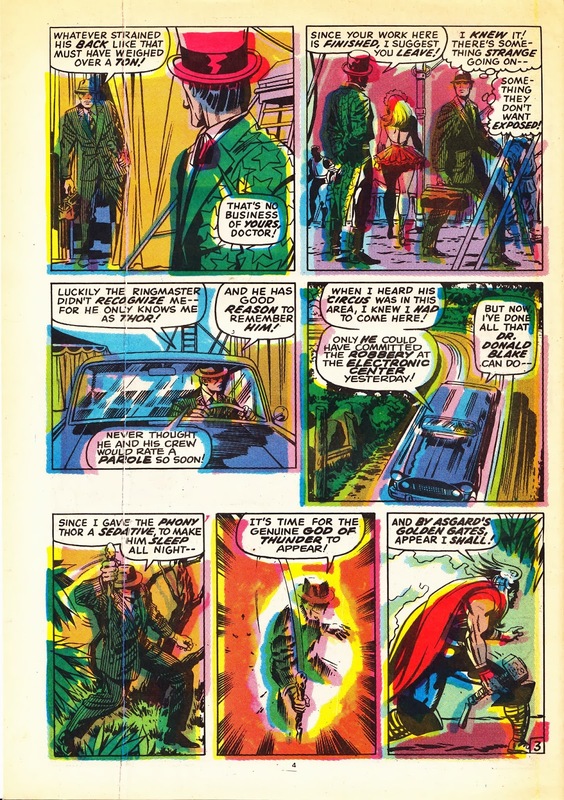 The problem was only really sorted when Marvel drastically reduced the number of colour interior pages for "economic reasons" after a few months. Cynically, I suspect all three new launches were intended to test the technology, economics and reader reaction to colour printing before rolling-out the format change to established titles such as SPIDER-MAN (which switched in the summer) and STAR WARS (timed to coincide with the relaunch as RETURN OF THE JEDI weekly). 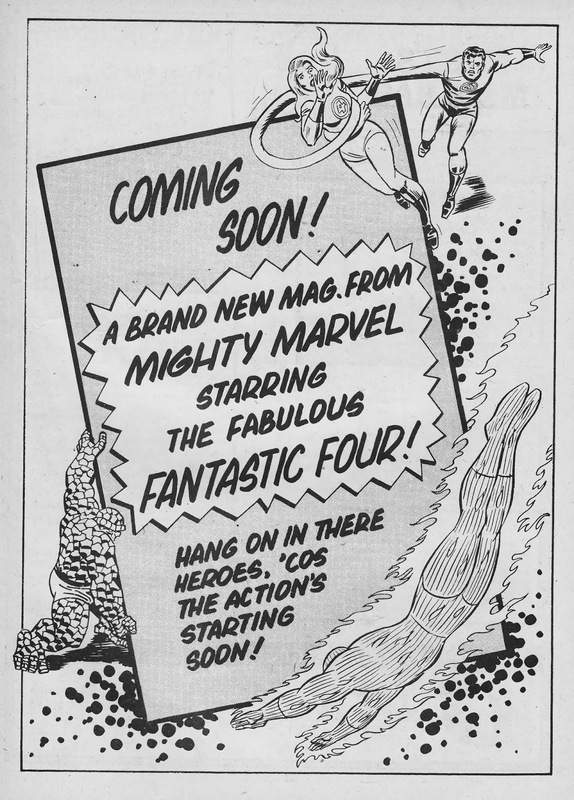 Here's another MARVEL UK House Ad, this time plugging the impending launch of the 1977-78 THE COMPLETE FANTASTIC FOUR weekly, the British Bullpen's first punt at launching the foursome in a solo title. This ad appeared in THE MIGHTY WORLD OF MARVEL issue 259, cover-dated 14 September 1977. 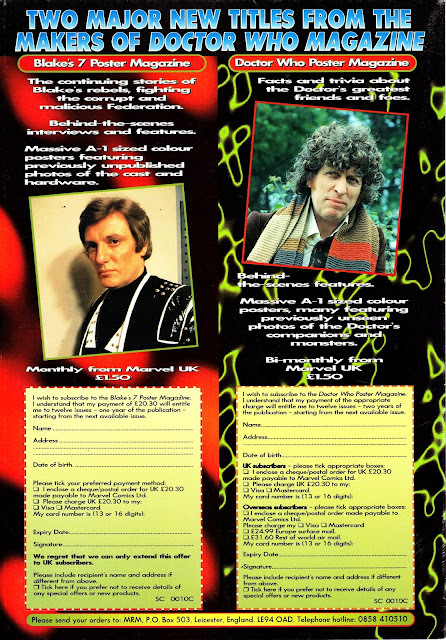 This is a House Ad for two rather ill-fated 1994-95 additions to the MARVEL UK line: BLAKE'S SEVEN POSTER MAGAZINE and DOCTOR WHO POSTER MAGAZINE. 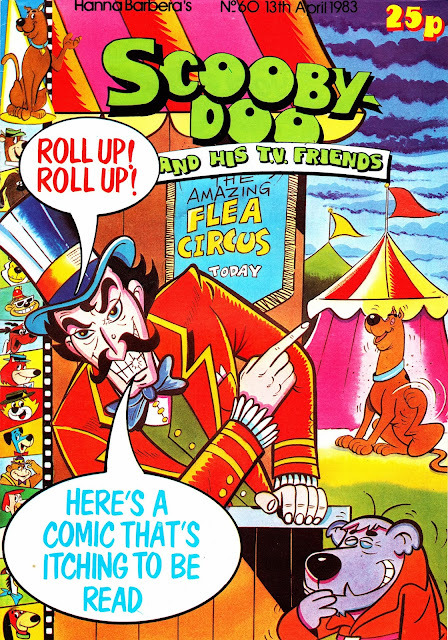 I never really understood the appeal of these two seventies throwbacks... or who exactly they were going to appeal too. 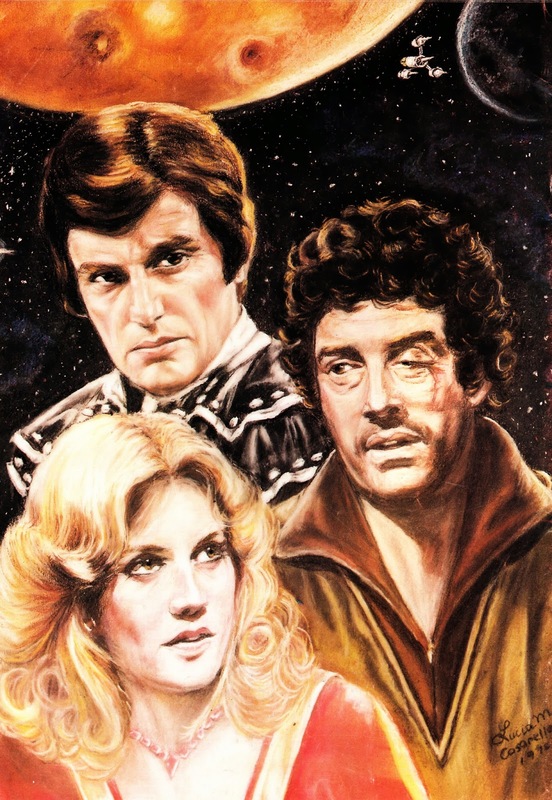 It's hard to imagine that the target audience for poster mags (surely pre-teen boys or - in the case of popular music combos - pre-teen girls) would have the remotest interest in either of these long-defunct TV shows and older fans - however loyal - would be unlikely to adorn their home with giant glossy pictures of Paul Darrow. 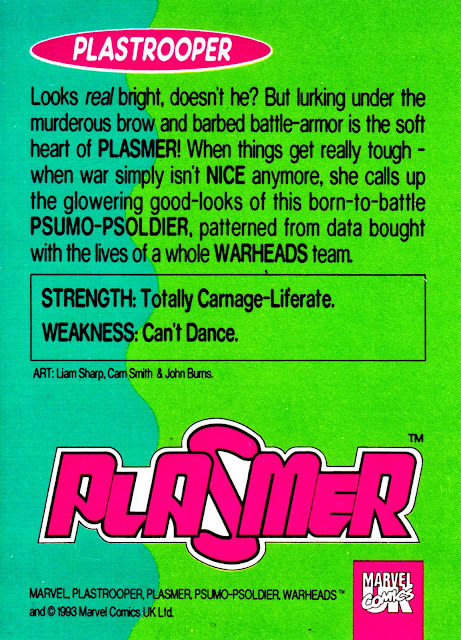 The very nature of poster mags is that text features (printed on the reverse side of the main attraction) tend to be a little scant in detail and - sure enough - the same was true here. 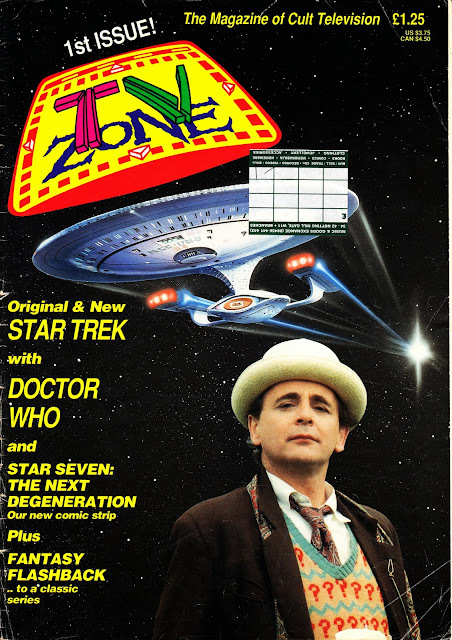 Although the B7 one did at least indulge in some original short fiction by authors fandom, at least, had heard of. Somewhere around this time, Visual Imagination clocked up a substantial run of STAR TREK: THE NEXT GENERATION Poster Mags and its possible that Marvel UK fancied a piece of the action. 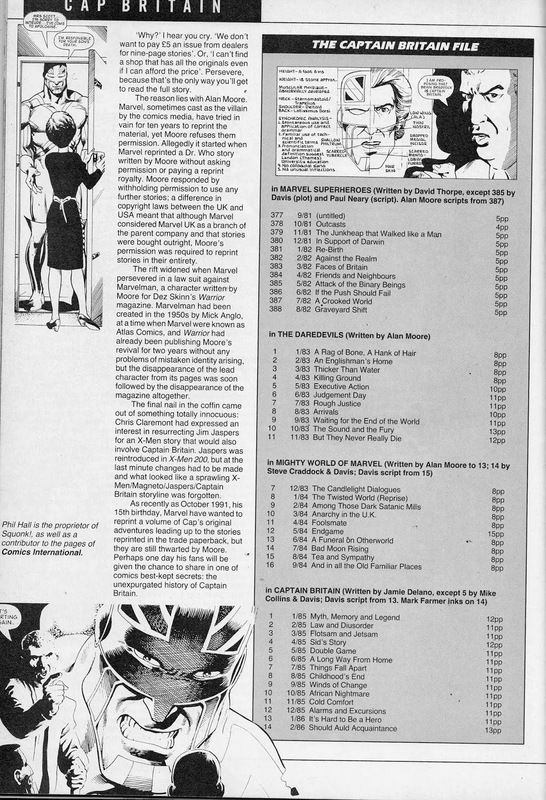 Sure enough, these soon succumbed to retrenching within the M-UK operation although this subscription advert, which filled one 'page' of each issue, continued to appear right until the end of the run. 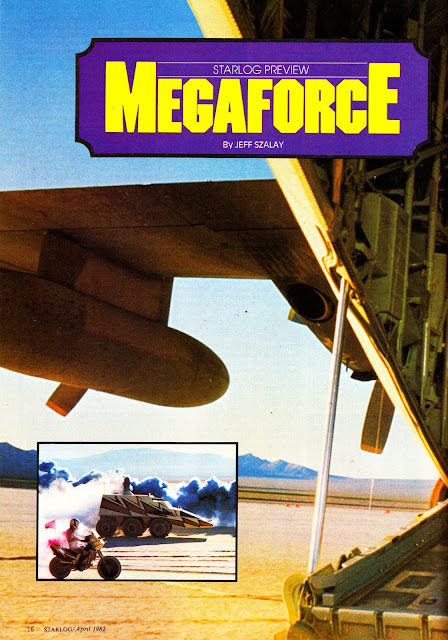 MEGAFORCE is, for me, the original G.I. 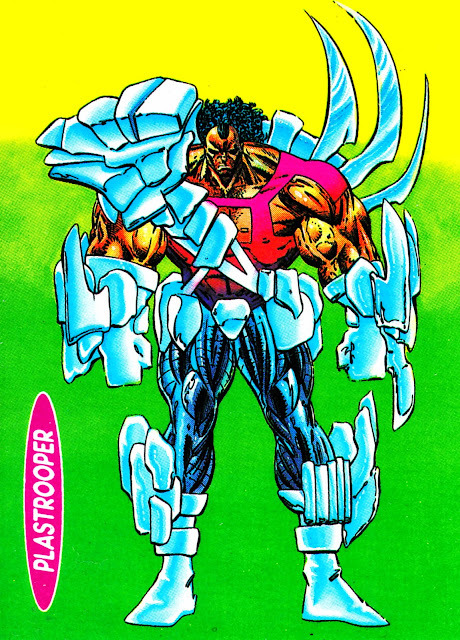 JOE/ ACTION FORCE live action movie: a hardware-centric, impractically costumed (in Wilma Deering's cast offs), counter-terrorist (not-at-all) covert special weapons force. I first saw this at someone's birthday party way-back-when there was still a novelty in hiring a tape from the local video library and keeping the teeny guests quiet for 90-odd minutes. This was at the height of ACTION FORCE's popularity (around 1984, at a guess) and MEGAFORCE seemed to me to be a (perfectly entertaining) wannabe. It's only much more recently that I've realised that it was actually (disastrously) released (at least in the US... 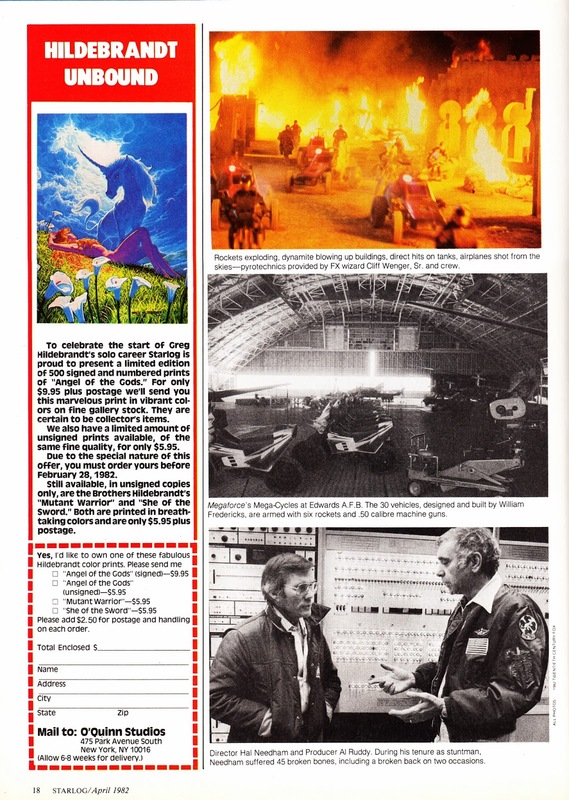 I'm not sure they even bothered with a UK cinema release) back in the Summer of 1982. That's bad timing as G.I. 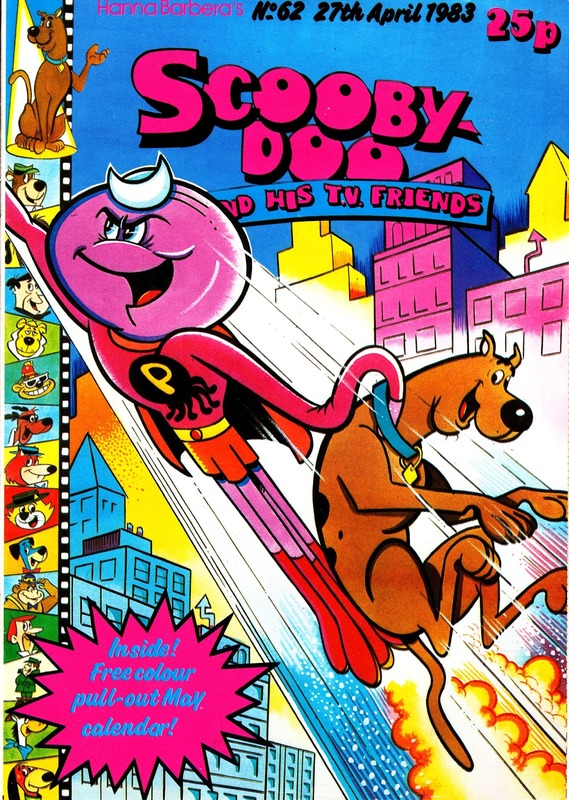 JOE's uber-successful Real American Hero incarnation was only just hitting American toy stores and had't yet become a super-hit. The TV-plugged Marvel Comic was stoking interest but the syndicated show was still a few years away. 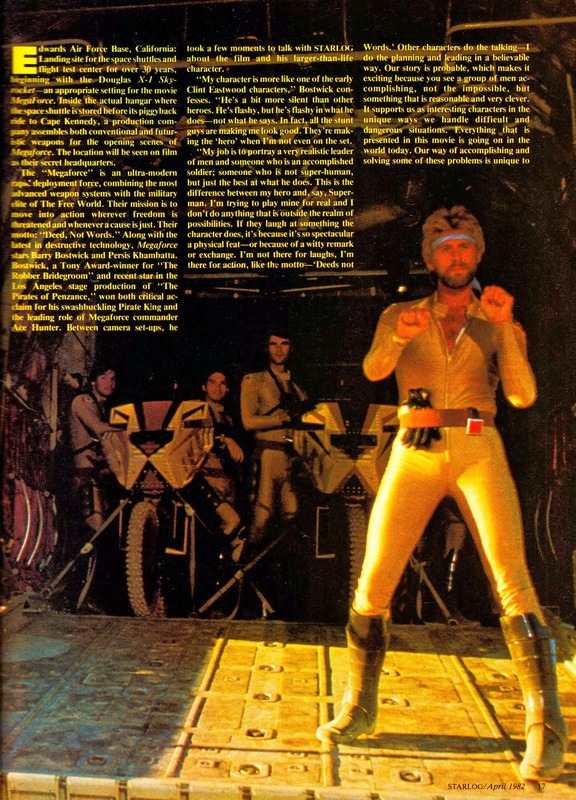 If MEGAFORCE had hit a year later (somehow dodging the RETURN OF THE JEDI Star Destroyer) then it might have been perfectly-placed to capitalise on JOE's success. 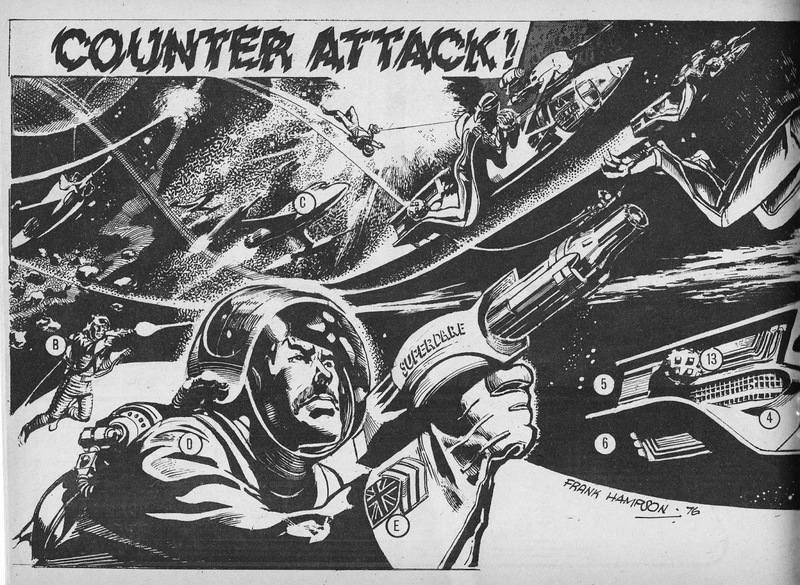 To date, the 'Force has been AWOL from DVD and BR (VERY covert operations, it seems) but it does (or, at least, did) occasionally crop-up as a British TV schedule-filler. 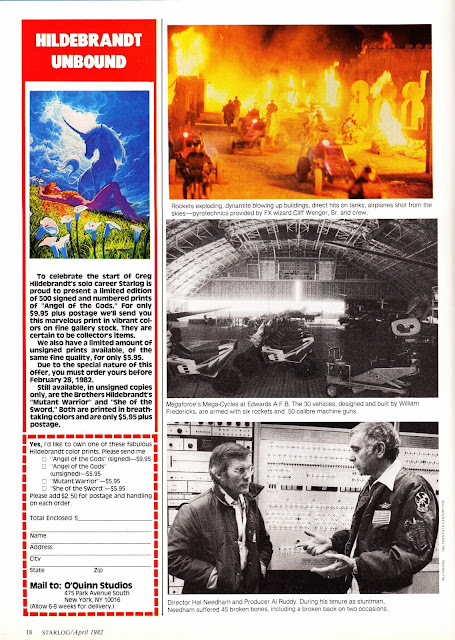 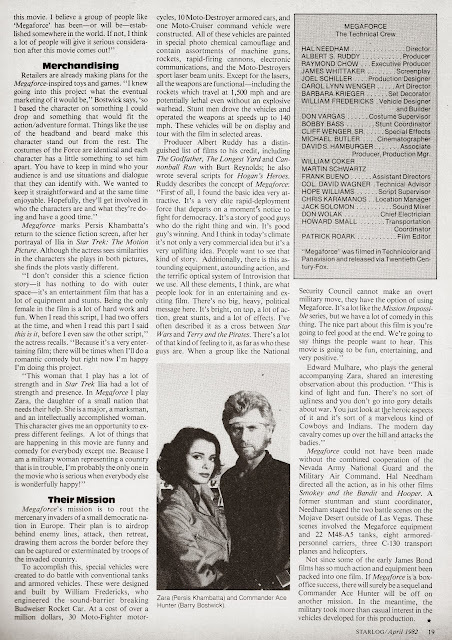 This article appeared in STARLOG MAGAZINE issue 57 (cover-dated April 1982). 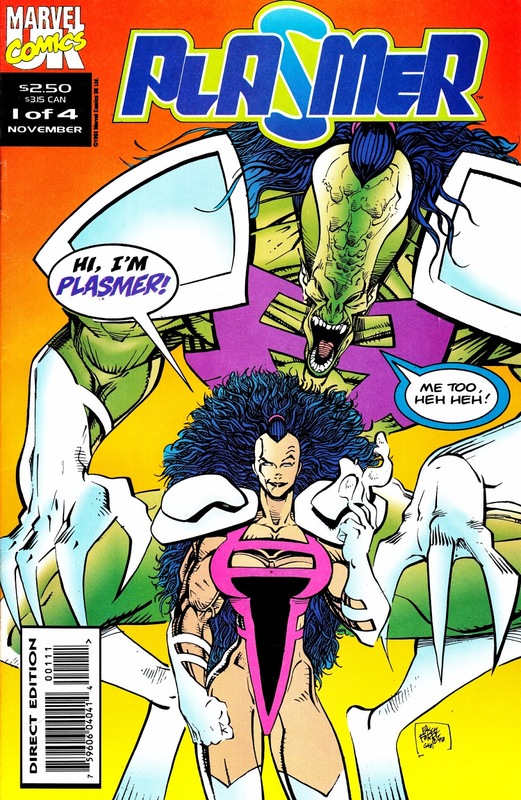 Anyone remember GIGGLES? Nope, not me. 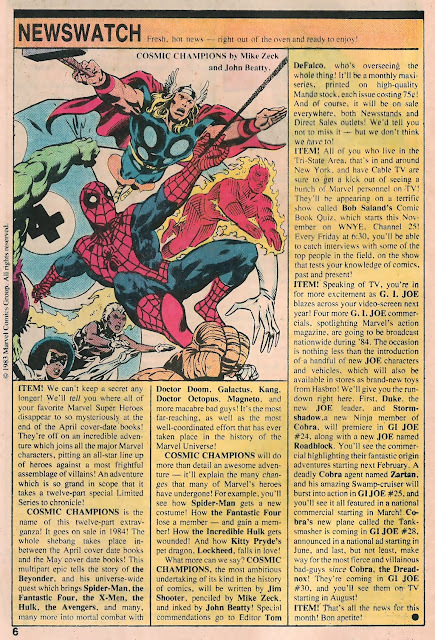 But MARVEL UK indulged in a little record plugging with this half-page (albeit from the TITANS format era, hence the portrait dimensions) feature from SUPER SPIDER-MAN AND THE SUPER HEROES issue 189 (cover-dated 22 September 1976). I suspect that there's more to this feature than just an excuse to plug Spidey's own (perfectly playable) recorded rock opera ROCK REFLECTIONS OF A SUPER HERO. Was Neal Tennant just trying to indulge his real passion? 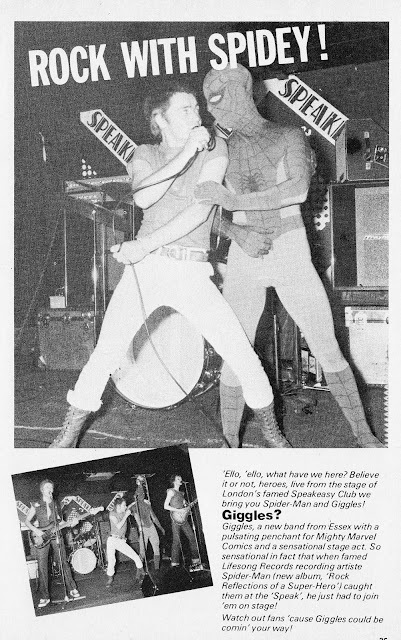 Were Giggles somehow affiliated to the British Bullpen? As a coda to my recent series of posts, and because Ed reminded me that I had a scan tucked away on file, here is the cover of the MARVEL UK'S THE PUNISHER AUTUMN SPECIAL 1992. 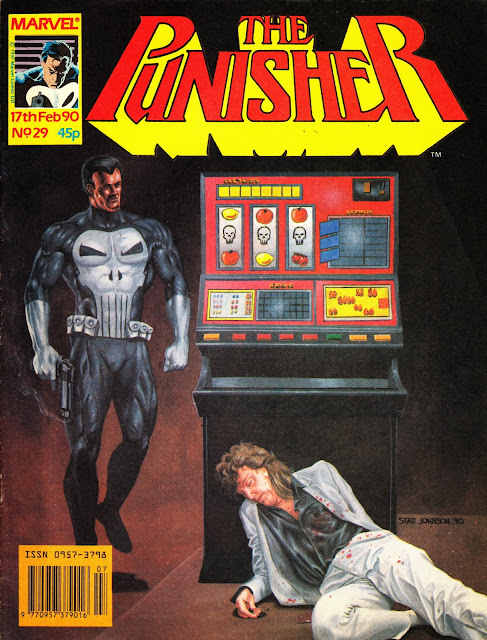 I guess sudden death (along with bad movie adaptations) is an occupational hazard in Frank Castle's line of work. 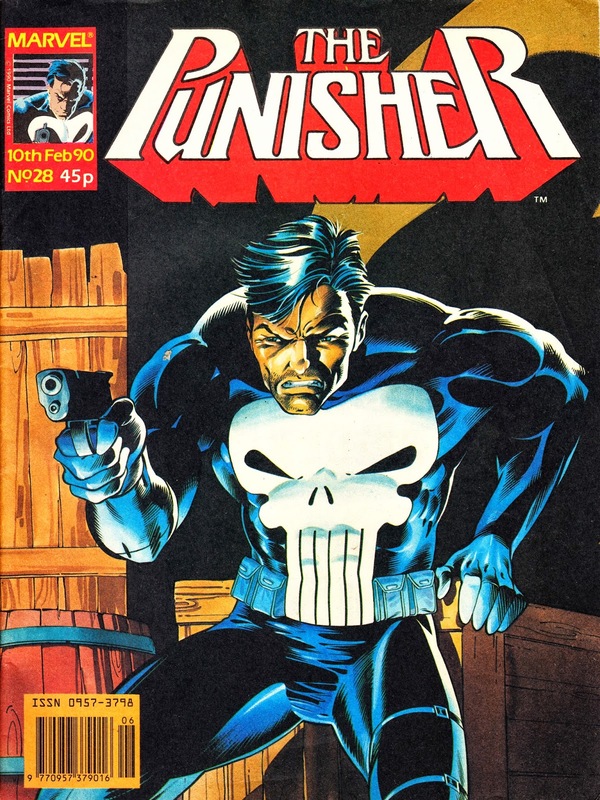 That might help the sudden and unheralded (and hardly glorious) demise of Marvel UK's THE PUNISHER comic. 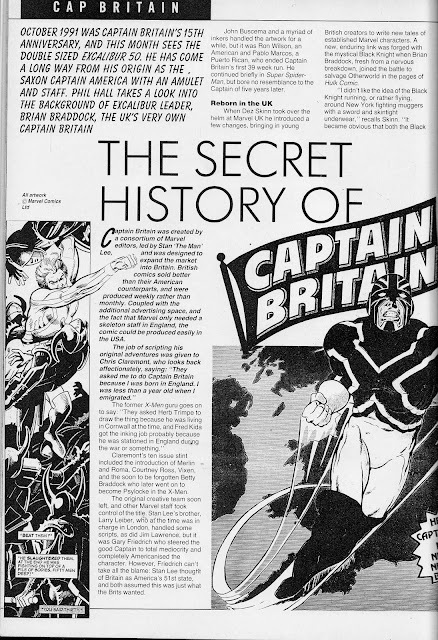 Things seemed to be chugging along nicely until the sudden - and apparently last-minute - announcement that, from issue 30, the frequency was suddenly halved... to fortnightly. 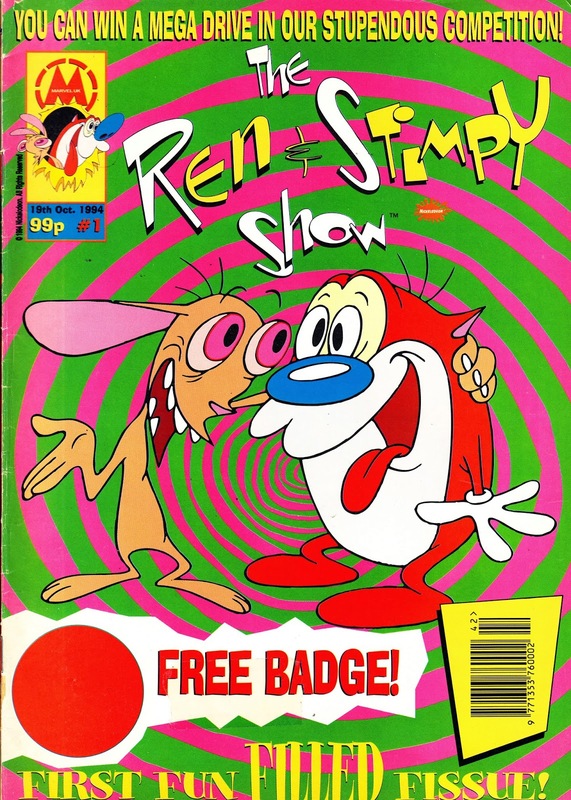 And we're still waiting for the 31st issue. 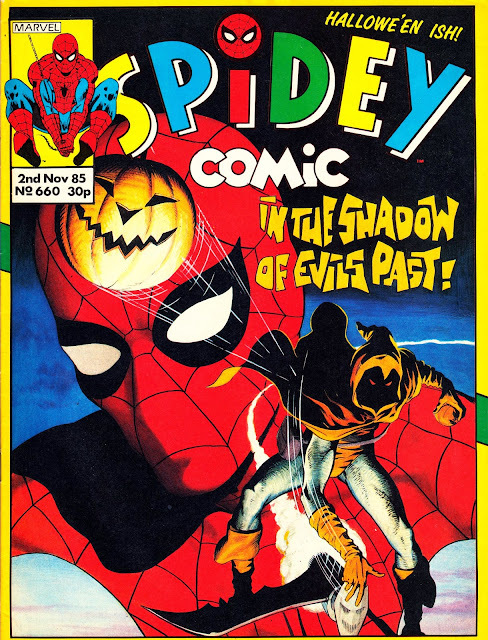 Although he never had a chance to say goodbye, there was a merger of sorts when a reprint of one of Castle's early seventies adventures suddenly appeared in STRIP MAGAZINE, accompanied by a sew-on badge (similar to the ones that adorned the first issues of STAR TREK: THE NEXT GENERATION (here) and THE COMPLETE SPIDER-MAN (here). 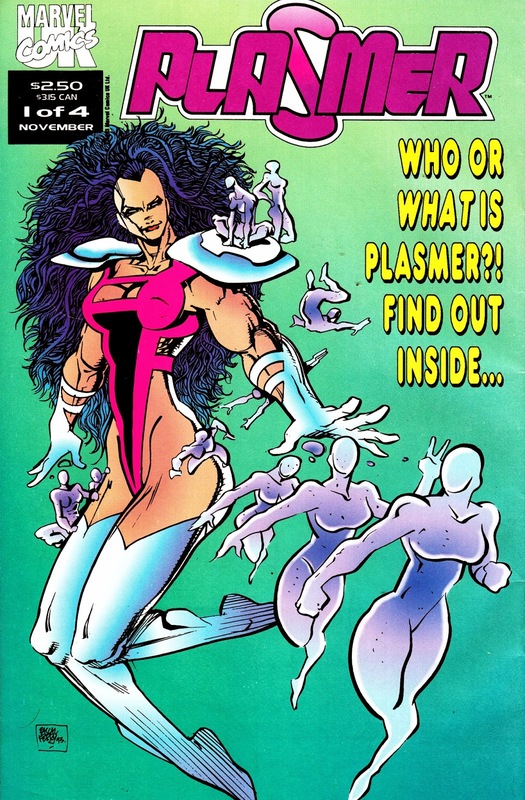 Cover by Larson, Williams and Place. First fortnightly issue and - err - last issue. 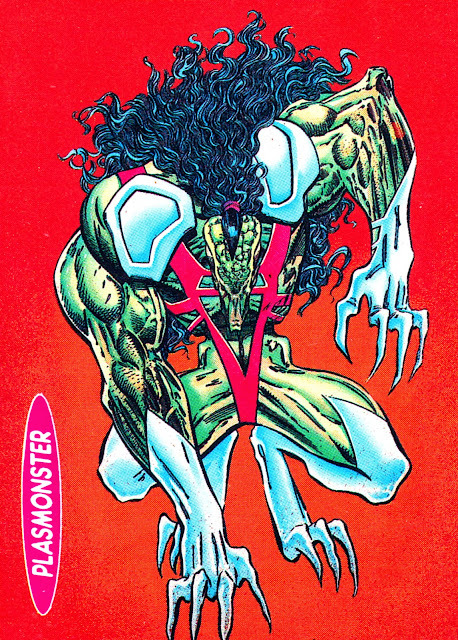 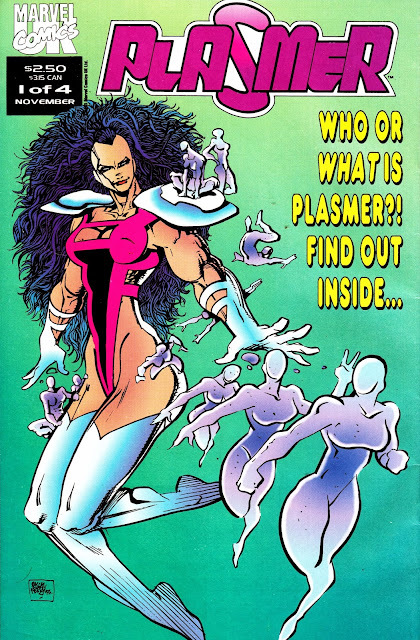 PLASMER was one of the very last series to launch during the final months of the GENESIS 92 era with the first issue hitting the shelves somewhere around September 1993. 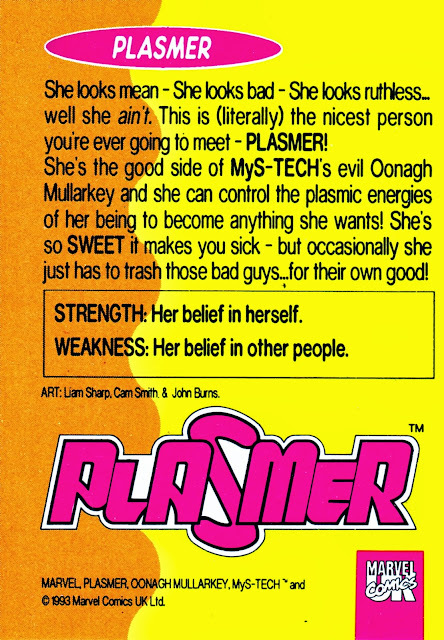 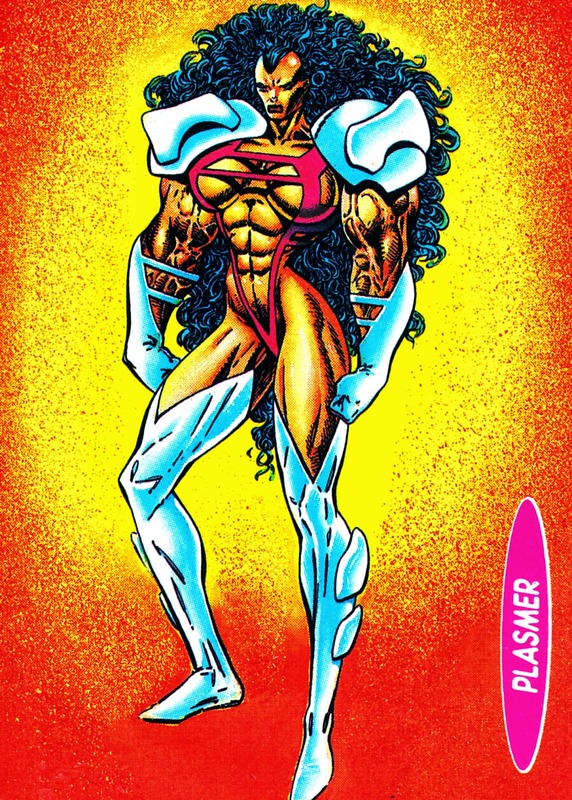 Created by Glenn Dakin, Pascual Ferry and Sean Hardy, the conceit was that Plasmer was one person split (by MyS-TECH, of course) into her purely good and purely bad halves. The first issue was bagged with four trading cards, the last set of Marvel UK cards to see the light of day. 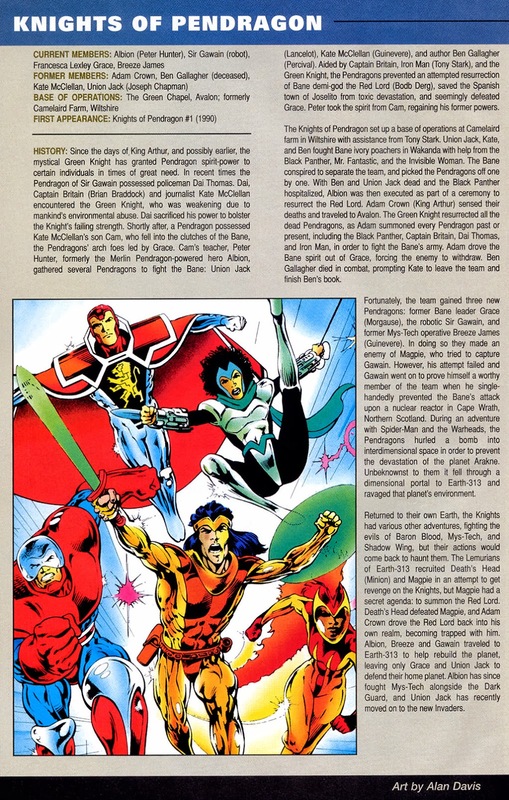 Another set, Red Mist 2020, was planned to accompany the first issues of that three-book crossover but the project - and the cards - were spiked pre-publication. The series was mid-way through a reprint in Britain's OVERKILL when that comic was pink-slipped. Dakin mentioned at the recent Marvel UK panel at the London Film and Comic Con that a trade paperback collection was published... in Spain. The four-issue didn't make much of an impact at the time (or - indeed - since) but did generate some infamy when Marvel's Stateside lawyers used the character as a reason to try and block the publication of Jim Shooter's similarly-named new comic. Shooter's new enterprise (after it all got a bit nasty at Valiant) Defiant Comics was planning PLASM as their first launch until Marvel's lawyers got wind of the plan and sued (Shooter had been - of course - Marvel's Editor-in-Chief until he was sacked during the New World era. He'd subsequently put together an unsuccessful bid to buy the company) forcing a hasty name-change to WARRIORS OF PLASM. 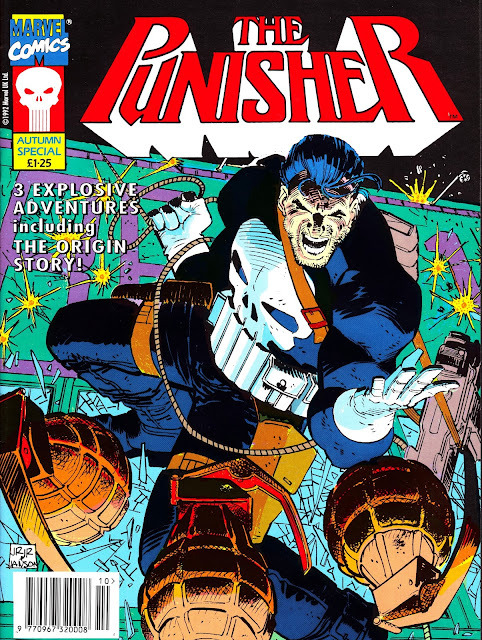 The renamed book, and the company, didn't last long and Shooter blamed the cost of fighting Marvel in court as a contributory factor in its demise.